Like any shellfish, crabs are highly perishable and their quality deteriorates quickly once they're taken from the sea. 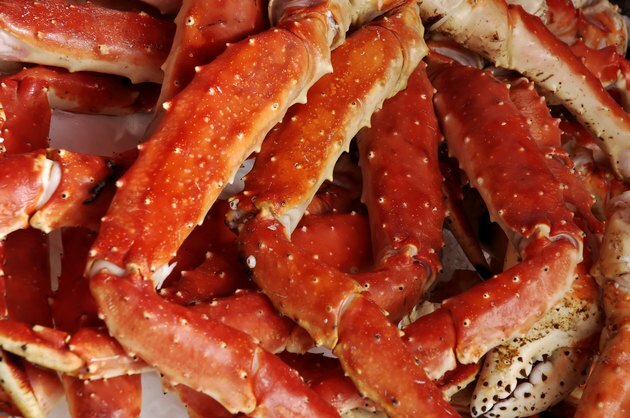 In populous coastal areas it's possible to buy good quality fresh crab, but in much of the country, the best option is frozen snow crab or king crab legs. These are cooked in light brine and flash-frozen right on the boats that harvest the crab. This ensures that their fresh flavor is preserved, from the boat to your kitchen. Because they're precooked, you don't even need to thaw the crab legs before reheating them. Run water into your steamer until you've reached the fill line. If you're using a pot with a steamer insert, run enough water to come right to the bottom of the steamer. Place the pot or steamer on a burner at high heat. Cover, and watch for it to come to a boil. Open the lid once steam is billowing out from under it. Take care not to scald yourself with the hot steam. Fill the pot with crab legs, and replace the lid. Wait for the steam to begin billowing from under the lid again, and note the time. Steam Alaskan king crab legs for 10 minutes to heat them thoroughly from frozen. Snow crab or other crab legs will take a shorter time, usually six to eight minutes. Serve hot with clarified butter, or use the crab meat in your favorite recipe. Never buy any frozen seafood that shows signs of having thawed and been refrozen.